I discovered a good reason to postpone pruning. This Caroline Wren, Thryothorus ludovicianus, perched contentedly on the spent bloom stalk of a Soft Leaf yucca, Yucca recurvifolia. These little songbirds are rarely still. They flit constantly in the underbrush, looking for insects, flicking their tail feathers, and hopping from limb to branch to ground. This one, quiet and tranquil for a time, rested safely on the unpruned stalk, a testament to the gardener’s commitment to an unkempt, wildlife friendly garden and a certain level of laziness. This entry was posted in Native habitat, Uncategorized, Wildlife Gardening, Winter pruning by Tina. Bookmark the permalink. Wow, I totally agree! My husband is always asking me why I have dead “sticks” all over the yard. I leave my old Texas Star Hibiscus stalks that are outside my window up all winter. All the birds and hummers hang out there and keep my cat and I entertained. Good for you!! Down with the sterile American landscape where every plant becomes a box or a ball or nothing! I have started pruning, just because I can’t get it all done by the end of February unless I start. But I’ll leave the birds’ favorites until the last possible moment. I thought of you a couple of days ago when I heard a birdcall that was new to me: a clear, repetitive, two note call. I couldn’t find the bird, because it was hidden away in our unpruned crepe myrtles. (I know, but apartment landscapers love them.) When it flew, it was as small as your wren, and brownish. I’ll be keeping an ear out for it. I’m still weak on bird calls, getting better at it, but not so great. If you have a smart phone, check out Cornell Lab’s “Merlin app for identifying birds when you’re out and about. I’ve found it’s really handy. Tina Caroline Wren is a beautiful bird. And if it sings better. Not to the pruning and if to the sticks so that the birds support. I have not pruned the lavenders because with the frost the twigs that in the end have had the flower are split well and disappear more than half. I imagine the birds take them to make their winter lairs. Greetings from Margarita. You’re very wise to leave the “sticks” of the winter garden for the birds–and so many other critters, too! Good move … totally justified! Isn’t that little thing cute? 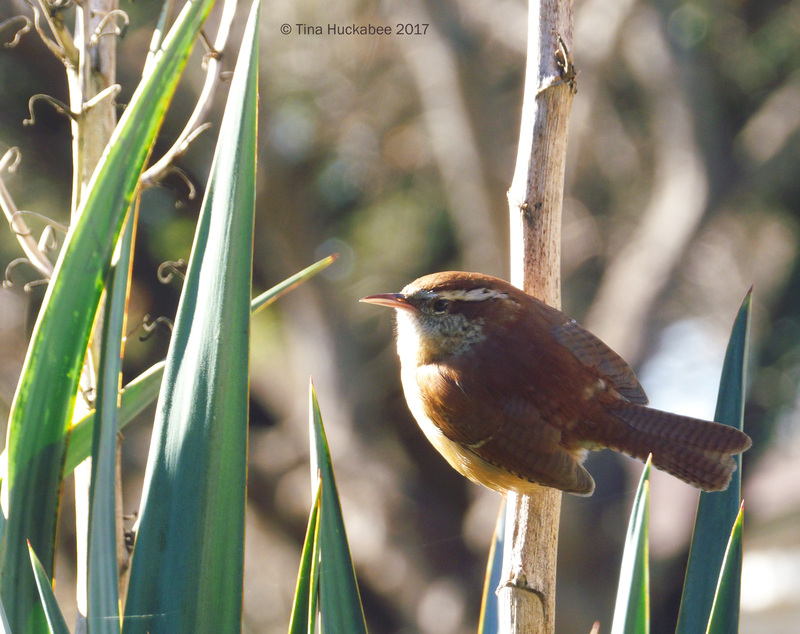 Love those Carolina wrens! I have often said procrastination is the gardener’s friend. You are wise, my gardening friend! A very cute bird Tina and new for me. No hurry with the ‘spring’ cleaning!